Our Sports bottles are used by countless people across the country, offering a great way to stay hydrated without having to buy more water when you're out and about. So in addition to being functional, these sports bottles offer a great way to advertise and brand so people can carry your message with them wherever they go. 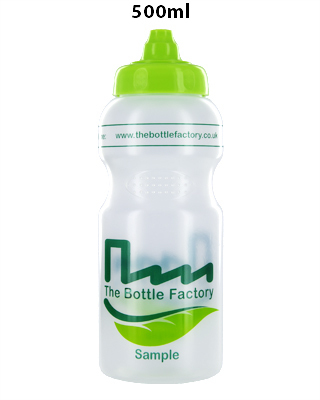 Here at The Bottle Factory we specialise in offering printed sports bottles to get your brand image across in a that unique way. Our sports bottles made from the highest quality plastic only reserved for products in the food/drinks industry. They are also totally recyclable. One of the unique aspects of our bottles are the caps. These are designed with one-way valves to eliminate the threat of choking. Click here -> video icon to see how the caps work. This unique design makes our sports bottles ideal for children. The many schools we supply insist on having these caps over the traditional push-pull type. Re-using normal plastic bottles isn't always a good idea. 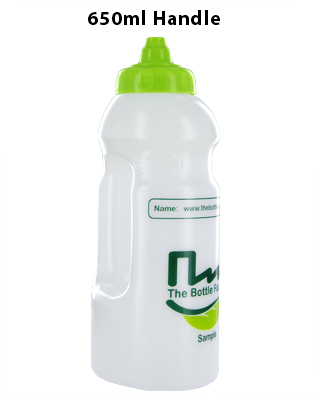 They can quickly deteriorate to give you a less than quality product, but our sports bottles have been specially made to the highest quality and will last a long time. They are also dishwasher proof. This give you a safe and hygienic sports bottles that can easily be re-used. Our sports bottles are not to be confused with some of the more flimsy products on the market today. We have four different size bottles to choose from, as such you can tailor the bottle size and shape specifically to suit your needs. You can choose from several different colours (5 colours available) of sports bottles. You also have the option to choose the colour of the cap (7 colours available), and with our fantastic printing facilities you can have your own artwork or logo printed on them to perfectly promote your business/school/club. You can configure your own sports bottle and obtain real-time pricing by going to our Pricing page. We are different to many of our competitors in that we actually manufacture and print our own sports bottles in the one production facility. This enables us to provide exceptionally quick turn around times and offer very competitive pricing. By consolidating the manufacturing and printing processes in the one location, we reduce the carbon footprint normally associated with this business. We're also pleased to say that we've achieved an impressive 35% recycle rate whilst managing to maintain our exceptionally high standards of quality, something that's difficult to achieve in this industry. 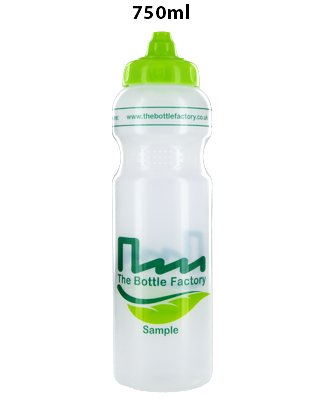 Here at The Bottle Factory, we're proud of all of the sports bottles that we're able to produce. We're confident that you will be too. 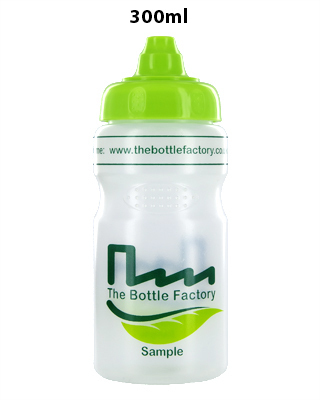 The Bottle Factory is the place to bulk buy sports bottles to give out to your employees, school children, clients, colleagues, club members or indeed anyone else.